Participants Data were from two of the Midspan prospective cohort studies (9559 men): “Main” study 1965-8, participants from workplaces across central belt of Scotland, population of island of Tiree, and mainland relatives, and “Collaborative” study, 1970-3, participants from 27 workplaces in Glasgow, Clydebank, and Grangemouth. Follow-up was to 31 December 2007 (median 29 years, range 0.13-42). We divided participants into nine groups based on measures of body mass index (BMI) (underweight/normal weight <25, overweight 25 to <30, and obese ≥30) and alcohol consumption (none, 1-14, and ≥15 units per week). Results 80 (0.8%) men died with liver disease as the main cause and 146 (1.5%) with liver disease as any cause. In the Collaborative study, 196 men (3.3%) had liver disease defined by a death, admission, or cancer registration. BMI and alcohol consumption were strongly associated with liver disease mortality in analyses adjusted for other confounders (P=0.001 and P<0.0001 respectively). Drinkers of 15 or more units per week in any BMI category and obese drinkers had raised relative rates for all definitions of liver disease, compared with underweight/normal weight non-drinkers. Drinkers of 15 or more units per week had adjusted relative rates for liver disease mortality of 3.16 (95% confidence interval 1.28 to 7.8) for underweight/normal weight men, 7.01 (3.02 to 16.3) for overweight, and 18.9 (6.84 to 52.4) for obese men. The relative rate for obese men who consumed 1-14 units per week was 5.3 (1.36 to 20.7). The relative excess risk due to interaction between BMI and alcohol consumption was 5.58 (1.09 to 10.1); synergy index=2.89 (1.29 to 6.47). The international epidemic of obesity9 raises the possibility that heavy alcohol intake and obesity could be working in unison to elevate risk of liver disease. The mechanisms by which alcohol and obesity affect the liver are not fully understood but biochemical and pathological evidence suggests that common pathways exist.10 In moderate drinkers alanine aminotransferase, which indicates hepatic damage, is raised to a greater extent in those with higher BMI,11 and alcoholic and non-alcoholic fatty liver disease are pathologically similar.12 The high prevalence of people who consume excess alcohol and are overweight or obese means that a better understanding of their prognosis is of clinical importance. Additionally, as liver disease is often advanced when diagnosed, primary prevention is crucial to reducing the burden. We investigated whether alcohol and obesity could be acting together to increase the risk of liver disease. The first Midspan study was known as “Main”, and included employees in several workplaces across the central belt of Scotland, the population of the island of Tiree, and their relatives on the mainland.13 14 The study was conducted between 1965 and 1968 with participants aged from 14 to 92 years at screening. The second Midspan study, known as the Collaborative study, included employees aged 21-75 years from 27 workplaces in Glasgow, Clydebank, and Grangemouth between 1970 and 1973.15 Only men were included in the current analysis because numbers of women and of events in women in the two studies were small. The studies consisted of a self completed questionnaire followed by a screening examination at a study clinic. The questionnaire included questions about usual weekly consumption of beer, spirits, and wine, occupation, smoking habit, bronchitis, angina, and diabetes. At the screening examination measurements were made for blood pressure and forced expiratory volume in 1 second (FEV1) and an electrocardiogram was done. Height and weight were reported in the questionnaire in the Main study, but were measured at the clinic in the Collaborative study. The question on alcohol consumption asked how many nips of spirits, pints of beer, and bottles of wine were usually consumed each week. Responses were converted to units of alcohol appropriate at the time (one unit was equal to half pint of beer, a measure of spirits, or a sixth of a bottle of wine) and divided into six categories (none, 1-7, 8-14, 15-21, 22-34, or ≥35 units).16 A unit of alcohol in the UK is equal to 8 g ethanol. Social class was derived from occupation according to the relevant version of the General Register Office Classification of Occupations (1960 for Main,17 1966 for Collaborative18). Social class was graded in six categories from I (professional) to V (unskilled), with III subdivided into non-manual or manual. Smoking was defined by number of cigarettes smoked per day for current and former smokers, with an additional term to denote former smokers. Bronchitis was defined by responses to the Medical Research Council bronchitis questionnaire19 and angina according to the Rose questionnaire.20 Presence of diabetes was taken as a positive response to a question asking if the participant had diabetes. At the screening examination, blood pressure was measured with a London School of Hygiene sphygmomanometer with the participant seated. FEV1 was measured with a Vitalograph spirometer (Garthur (London), Buckingham, UK) with the participant standing. Ischaemia on electrocardiogram was defined as any of Minnesota codes 1.1-1.3, 4.1-4.4, 5.1-5.3, and 7.1.21 BMI was calculated from weight in kg divided by height squared in m2 and categorised according to WHO categories underweight (<18.5), normal weight (18.5 to <25), overweight (25 to <30), and obese (≥30). Follow-up after screening was by flagging with the NHS Central Register. Dates of deaths and their causes as well as embarkations from the UK are notified monthly to the Midspan team. In addition, the Collaborative study participants have been linked with the Scottish Morbidity Records (SMR) data. The Privacy Advisory Committee of NHS Scotland Information Services gave permission for the linked data to be used in the current study. Acute hospital discharges (SMR1) and cancer registrations (SMR6) were used from 1972 to 31 December 2007. Any SMR records occurring before each individual’s screening date were excluded. Liver disease was defined as ICD9 codes 155 and 570-573, and ICD10 codes C22 and K70-K77, which include liver diseases and (primary) liver cancer. Mortality from liver disease was defined as having one of these causes as the underlying (main) cause of death. Mortality with liver disease mentioned in any position of the causes of death was also investigated. Follow-up was from the date of screening to the date of death, date of embarkation, or 31 December 2007 (median 29 years, maximum 42 years). A further analysis defined having liver disease as the participant having an SMR1 with any of the diagnosis codes for liver disease, or an SMR6 for liver cancer, or liver disease mentioned in any of the causes of death. Follow-up was to the date of the first occurrence of the SMR1, SMR6, death, embarkation, or 31 December 2007. This analysis was only possible for the Collaborative study because SMR data were not available for the Main study. The Main study included 3750 men and the Collaborative study 6022, giving a total of 9772. The 156 men who took part in both studies were included only once in the joint analysis. Data from the Collaborative study were used in preference to those of the Main study because BMI was measured in the Collaborative study, rather than self-reported. The 31 Main study men who were younger than 18 at screening were excluded because they would not have achieved an adult BMI. Other exclusions were five Collaborative men who were lost to follow-up and 24 Main men and one Collaborative man with missing BMI. Of the 24 Main men with missing BMI, four were duplicates and their data were available from the Collaborative study. In total 9559 participants were included in the study. The analyses using just the Collaborative study data included 6016 participants. All analyses were done with Stata (release 10). The underweight category included 74 participants (27 Main, 47 Collaborative). Since only one death from liver disease occurred in the underweight category it was combined with the normal weight category. Sub-group analyses were also done after excluding underweight participants. Men known to have left the UK (Main 7, Collaborative 50) were censored at the date of embarkation. Cox proportional hazards models were used to obtain relative rates of mortality from liver disease (or having liver disease) by BMI category and for one standard deviation (SD) increase in BMI. The baseline category was taken as the underweight/normal weight category. Similar analyses were done by alcohol category and per unit increase in weekly consumption, with non-drinkers as the baseline. Relative rates were also obtained for BMI and alcohol consumption combined. For this analysis, the alcohol categories were regrouped into three categories of none, 1-14, and ≥15 units per week, so constructing nine groups of BMI and alcohol. The underweight/normal weight non-drinkers were used as the baseline category. Proportional hazards assumptions were checked using Schoenfeld residuals. Tests for interaction with study did not provide strong evidence of difference between the Main and Collaborative studies (P values shown in tables). The proportional hazards models were first adjusted for age at screening and study, and were then adjusted for other risk factors (social class, smoking, systolic blood pressure, height, bronchitis, FEV1, angina, ischaemia on electrocardiogram, and diabetes). Missing values of these risk factors were substituted with the study-specific means or modes. Adjustment for systolic blood pressure was not included in the analyses with alcohol consumption because of strong evidence that alcohol intake increases blood pressure.22 Such adjustment would have been for a variable on the causal pathway between alcohol and mortality. The mortality analyses were repeated after excluding deaths and embarkations in the first five years of follow-up and the first 10 years of follow-up, since participants with pre-existing liver disease might have had lower than usual BMIs at screening or could have given up alcohol due to ill health and therefore appeared in the non-drinking category. These factors could have led to underestimation of the association of BMI or alcohol with liver disease mortality. To investigate any supra-additive (sometimes called biological23 or causal24) interaction between BMI and alcohol consumption, the relative excess risk due to interaction and the synergy index were obtained, using the methodology of Andersson et al.25 The hypothesis was that the combined effect of high BMI and alcohol would be greater than the simple additive effects of each factor separately. In this case the relative excess risk due to interaction would be greater than zero and the synergy index would be greater than one. For this analysis, high BMI was defined as being overweight or obese, and high alcohol consumption defined as drinking 15 or more units per week. The mean age at screening of the 9559 men was 47.3 years (SD 9.55). Just under half the men were either overweight (42%) or obese (6%) (table 1)⇓. Eighty men (0.8%) died with liver disease as the main cause of death, and 146 (1.5%) died with liver disease mentioned in any of the causes of death. BMI was strongly associated with death from liver disease defined as the main cause (relative rate adjusted for age and study per SD increase in BMI=1.48, 95% confidence interval (CI) 1.20 to 1.81) or as any of the causes (1.46, 1.26 to 1.70). Overweight men had higher relative rates than underweight/normal weight men, and obese men had very high relative rates: fivefold increase for liver disease as the main cause and nearly fourfold increase for liver disease as any cause. Adjustment for risk factors caused a little attenuation. The men reported consuming an average of 16.56 units of alcohol per week. The type of alcohol consumed was predominantly beer (68.5% of units), spirits accounted for 28.3%, and wine consumption was very low (3.2%). While 35% of men reported consuming no alcohol, 27% reported consuming 15 or more units per week (table 2)⇓. Very strong relations were noted between alcohol consumption and liver disease mortality, with the increase starting with drinkers of 15-21 units for liver disease as the main cause, and with 8-14 units for liver disease as any cause. Adjustment for risk factors caused some attenuation but the strong relations remained. With the men divided into nine groups by BMI and drinking status, high relative rates for liver disease mortality were seen for drinkers of 15 or more units per week in any BMI category, and in obese drinkers, compared with underweight/normal weight non-drinkers (table 3)⇓. With no deaths from liver disease in the obese non-drinkers, no risk information could be obtained from the model for that group. For drinkers of 1-14 units and 15 or more units risk increased across the BMI groups. Similarly within the overweight and obese groups risk increased by amount drunk. Obese drinkers of 15 or more units had the highest relative rate (18.7, 95% CI 6.91 to 50.7). Adjustment for risk factors had a small effect. Similar findings were noted for liver disease as any cause of death and overweight drinkers of 1-14 units had elevated relative rates (table 4)⇓. In the Collaborative study 196 men (3.3%) had either a death or admission with any mention of liver disease, or a cancer registration for liver cancer (table 5)⇓. Results were similar to those for mortality only, with narrower confidence intervals because of the larger number of events. Obese men who drank 15 or more units had the highest relative rates of 10.5 (95% CI 4.80 to 23.1) compared with underweight/normal weight non-drinking men. We found strong evidence of a supra-additive interaction between BMI and alcohol consumption. The figure⇓ shows the excess risks due to BMI, alcohol consumption, and their interaction in an analysis of liver disease mortality (main cause) adjusted for all risk factors. 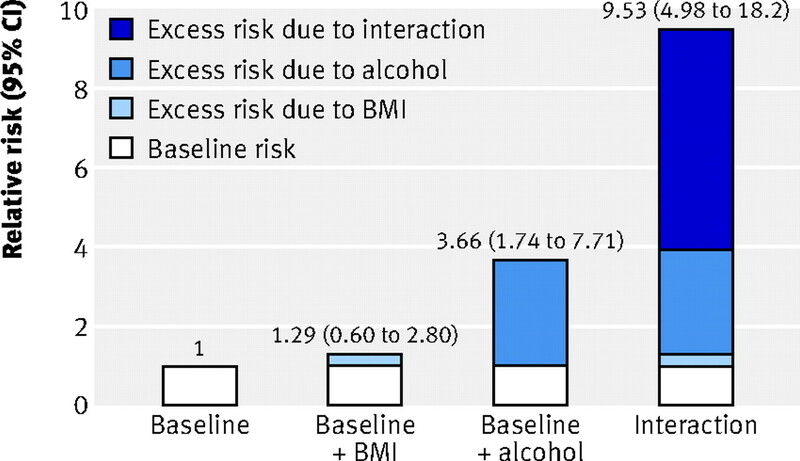 The excess risk due to BMI was small compared with that due to alcohol, but the relative excess risk due to interaction was large (5.58, 95% CI 1.09 to 10.1). The synergy index was 2.89 (1.29 to 6.47). The effect of the combination of high BMI and alcohol was clearly greater than the additive effect of the two separately; being both overweight or obese and consuming 15 or more units per week of alcohol led to a greater risk of dying of liver disease. Relative risks of contributions of BMI and alcohol to liver disease mortality (adjusted for all risk factors). Analyses excluding underweight and analyses excluding deaths in the first five or first 10 years yielded results similar to those reported here (see supplementary tables). The study was large, with more than 9000 participants, and had a long follow-up period of up to 42 years. BMI was measured at screening, whereas in cross sectional or clinical studies it is not possible to determine whether raised BMI preceded (and might increase risk of) liver disease or was caused by it. Reporting of alcohol consumption at screening meant that there was no recall bias. The alcohol data were reliable and similar to levels seen in a Scottish study in 1972.28 29 The study also benefited from the availability of the linked Scottish hospital discharge data and cancer registration data. Another advantage was the availability of other confounders for adjustment in the models. Limitations were that BMI and alcohol consumption could have changed in the follow-up period. This is a disadvantage of prospective cohort studies that can only be overcome by repeating surveys several times over the whole follow-up period. Alcohol consumption tends to decrease as people age,30 although since alcohol consumption increased in the wider population in the follow-up period, some participants might have increased their consumption after screening. It is not possible to reliably ascertain how these counterbalancing tendencies will affect our estimates of precise levels at which alcohol—and BMI, which has also increased over time, but can decrease in individuals at older ages—act together synergistically to influence liver disease risk. However, these changes are unlikely to have affected the existence of the interaction we report. Weight and height were self-reported in the Main study but measured in the Collaborative study. This difference is unlikely to have affected our conclusions since similar results were obtained when the studies were analysed separately. If self-reported heights were overestimated and self-reported weights were underestimated in the Main study, as is seen in some studies, then BMI would have been underestimated.31 However, a different study of Scottish men and women showed that both height and weight were underestimated, which resulted in a very slightly overestimated BMI.31 Waist and hip measurements were not taken in the studies, so alternative measures of obesity could not be used. Alcohol consumption was limited to units per week as no data were available on frequency of drinking or binge drinking. However, a small clinical study suggested that daily heavy drinking rather than less frequent binge drinking drove alcohol-related liver disease risk.32 Women could not be included because of small numbers and lack of events. A final limitation was that no clinical measurements of liver function were recorded in the study. A study in China found that abnormal levels of serum liver enzymes (alanine aminotransferase and serum γ-glutamyltranspeptidase) were more likely in drinkers of 40 g or more of alcohol per day who were also overweight or obese, compared with either single factor alone or neither factor.33 A cross-sectional study in Australia found that BMI was strongly associated with alanine aminotransferase.34 Obese participants who were heavy drinkers had the highest alanine aminotransferase levels and obesity accounted for half of the raised levels, compared with excess alcohol, which accounted for under 10%. This finding seems contrary to our results, in which alcohol had a greater effect than BMI on liver disease, although this discrepancy might reflect differences between countries. In a study of patients with alcoholism or alcoholic liver disease, excess weight in the previous 10 years was an independent risk factor for the development of alcoholic cirrhosis, acute alcoholic hepatitis, and steatosis.35 Excess weight was defined as BMI 27 or greater in men and 25 or greater in women. A later study of similar patients found that BMI in the year preceding hospitalisation (before symptoms appeared) was an independent risk factor for fibrosis.36 A small cross-sectional population study in Italy found that alcohol and obesity were both associated with hepatic steatosis, and being both a heavy drinker and obese led to a higher risk of hepatic steatosis.37 In a small clinical case-control study in the United States, Marrero found positive interactions between alcohol consumption and obesity in a study of hepatocellular carcinoma.38 However, in that study, BMI was measured when the patient was already ill, so values might not have reflected their usual weights. Prospective cohort studies have an advantage over clinical studies since BMI will generally reflect a healthy weight. A population based cohort study in the United States found a strong association between obesity and cirrhosis related death or hospitalisation in non-drinkers of alcohol, a weaker association in alcohol drinkers of up to 0.3 drinks per day, and no association in drinkers of more than 0.3 drinks per day.6 Drinkers, however, did have higher rates of death or hospitalisation than non-drinkers. As the participants in the present study were from general and working populations, the results may be generalisable to other populations. However, since the majority of the men were from working populations—and therefore healthier on average than general populations—the results might underestimate the absolute risk of liver disease, although the relative risks are likely to be generalisable to populations from similar contexts. The findings need to be validated in other large cohort studies and in women. Our findings have important clinical and public health implications. New perspectives on the risk of liver disease may need to be considered for people who are overweight and consume alcohol and lower, BMI specific “safe” limits of alcohol consumption may need to be defined. Liver disease is often advanced when it is diagnosed and therefore early clinical intervention and primary prevention are both important. In public health terms, the interaction is of importance because it indicates that clustering of BMI and alcohol intake would generate more disease in a population than if they were not associated with each other.39 Furthermore, simultaneous increases in both alcohol intake and obesity levels would generate higher levels and more rapid increases in liver disease than predicted from effects of each factor separately. From a public health perspective, strategies to jointly reduce both alcohol consumption and obesity among high risk populations with both risk factors are likely to produce much greater reductions in liver disease than through initiatives directed at each group separately. Reducing alcohol consumption may also be an effective element in weight reduction strategies. Health education is needed to highlight the combined risks of BMI and alcohol on liver disease. Further preventive efforts are also needed to limit the affordability and availability of alcohol and to increase physical activity. Contributors: All authors contributed to the design of the study. CLH analysed the data and wrote the first draft of the manuscript. All authors contributed to the redrafting of the manuscript and approved the final version. CLH is the guarantor, had full access to the data in the study, and takes responsibility for the integrity of the data and the accuracy of the data analysis. The other authors had full access to all the results. Victor Hawthorne carried out the original Midspan studies. Pauline MacKinnon is the Midspan administrator. Funding: This research was supported by the Chief Scientist Office of the Scottish Government, grant number CZG/2/421. They had no role in the study design; in the collection, analysis, and interpretation of data; in the writing of the report; and in the decision to submit the article for publication. They did see a copy of the manuscript before it was submitted for publication, in line with their requirements. DB is a Wellcome Trust Fellow (WBS U.1300.00.006.00012.01). The Medical Research Council Social and Public Health Sciences Unit receives funding from the UK Medical Research Council and the Chief Scientist Office at the Scottish Government Health Directorates. The researchers were independent of the funders. Competing interests: All authors have completed the Unified Competing Interest form at www.icmje.org/coi_disclosure.pdf (available on request from the corresponding author) and declare that (1) CLH, DSM, and RJM have support from the Chief Scientist Office of the Scottish Government, grant number CZG/2/42 for the submitted work; (2) no relationships with any companies that might have an interest in the submitted work in the previous 3 years; (3) their spouses, partners, or children have no financial relationships that may be relevant to the submitted work; and (4) no non-financial interests that may be relevant to the submitted work. Ethical approval: Not required at the time of the studies. The Privacy Advisory Committee of NHS Scotland Information Services gave permission for the linked data to be used in the current study. Data sharing: No additional data. Leon DA, McCambridge J. Liver cirrhosis mortality rates in Britain from 1950 to 2002: an analysis of routine data. Lancet2006;367:52-6. Morrison DS, Boyd AA, Richardson T. Liver cirrhosis mortality rates in Britain. Lancet2006;367:1899. Leon DA, McCambridge J. Liver cirrhosis mortality rates in Britain—authors’ reply. Lancet2006;367:1900. Bosetti C, Levi F, Lucchini F, Zatonski WA, Negri E, La Vecchia C. Worldwide mortality from cirrhosis: an update to 2002. J Hepatol2007;46:827-39. Larsson SC, Wolk A. Overweight, obesity and risk of liver cancer: a meta-analysis of cohort studies. Br J Cancer2007;97:1005-8. Ioannou GN, Weiss NS, Kowdley KV, Dominitz JA. Is obesity a risk factor for cirrhosis-related death or hospitalization? A population-based cohort study. Gastroenterology2003;125:1053-9. Batty GD, Shipley MJ, Kivimaki M, Barzi F, Davey Smith G, Mitchell R, et al. Obesity and overweight in relation to liver disease mortality in men: 38 year follow-up of the original Whitehall study. Int J Obes2008;32:1741-4. Hart CL, Batty GD, Morrison DS, Mitchell RJ, Davey Smith G. Obesity, overweight and liver disease in the Midspan prospective cohort studies. Int J Obes2010; published online 9 February. Diehl AM. Obesity and alcoholic liver disease. Alcohol2004;34:81-7. Alatalo PI, Koivisto HM, Hietala JP, Puukka KS, Bloigu R, Niemela OJ. Effect of moderate alcohol consumption on liver enzymes increases with increasing body mass index. Am J Clin Nutr2008;88:1097-103. Angulo P. Nonalcoholic fatty liver disease. N Engl J Med2002;346:1221-31. Hart CL, MacKinnon PL, Watt GCM, Upton MN, McConnachie A, Hole DJ, et al. The Midspan Studies. Int J Epidemiol2005;34:28-34. Hawthorne VM, Gillis CR, Lorimer AR, Calvert FR, Walker TJ. Blood pressure in a Scottish island community. BMJ1969;4:654. Davey Smith G, Hart C, Hole D, MacKinnon P, Gillis C, Watt G, et al. Education and occupational social class: which is the more important indicator of mortality risk? J Epidemiol Community Health1998;52:153-60. Hart CL, Davey Smith G. Alcohol consumption and mortality and hospital admissions in men from the Midspan Collaborative cohort study. Addiction2008;103:1979-86. General Register Office. Classification of occupations 1960. HMSO, 1960. General Register Office. Classification of occupations 1966. HMSO, 1966. Medical Research Council. Definition and classification of chronic bronchitis for epidemiological purposes. Lancet1965;i:775-9. Rose GA, Blackburn H, Gillum RF, Prineas RJ. Cardiovascular survey methods. World Health Organization, 1982. Prineas RJ, Crow RS, Blackburn H. The Minnesota Code manual of electrocardiographic findings: standards and procedures for measurement and classification. John Wright, 1982. Chen L, Davey Smith G, Harbord RM, Lewis SJ. Alcohol intake and blood pressure: a systematic review implementing a Mendelian randomization approach. PLoS Med2008;5:461-71. Rothman KJ. Epidemiology: an introduction. Oxford University Press, 2002. De Mutsert R, Jager KJ, Zoccali C, Dekker FW. The effect of joint exposures: examining the presence of interaction. Kidney Int2009;75:677-81. Westerterp-Plantenga MS, Verwegen CRT. The appetizing effect of an aperitif in overweight and normal-weight humans. Am J Clin Nutr1999;69:205-12. Tremblay A, Wouters E, Wenker M, St-Pierre S, Bouchard C, Despres J. Alcohol and a high-fat diet: a combination favoring overfeeding. Am J Clin Nutr1995;62:639-44. Hart CL, Davey Smith G, Hole DJ, Hawthorne VM. Alcohol consumption and mortality from all causes, coronary heart disease and stroke: results from a prospective cohort study of Scottish men with 21 years of follow up. BMJ1999;318:1725-9. Dight SE. Scottish drinking habits. HMSO, 1976. Karlamangla A, Zhou K, Reuben D, Greendale G, Moore A. Longitudinal trajectories of heavy drinking in adults in the United States of America. Addiction2006;101:91-9. Bolton-Smith C, Woodward M, Tunstall-Pedoe H, Morrison C. Accuracy of the estimated prevalence of obesity from self reported height and weight in an adult Scottish population. J Epidemiol Community Health2000;54:143-8. Hatton J, Burton A, Nash H, Munn E, Burgoyne L, Sheron N. Drinking patterns, dependency and life-time drinking history in alcohol-related liver disease. Addiction2009;104:587-92. Shen Z, Li Y, Yu C, Shen Y, Xu L, Xu C, et al. A cohort study of the effect of alcohol consumption and obesity on serum liver enzyme levels. Eur J Gastroenterol Hepatol2009; published online 13 October. Adams LA, Knuiman MW, Divitini ML, Olynyk JK. Body mass index is a stronger predictor of alanine aminotransaminase levels than alcohol consumption. J Gastroenterol Hepatol2008;23:1089-93. Naveau S, Giraud V, Borlotto E, Aubert A, Capron F, Chaput J. Excess weight risk factor for alcoholic liver disease. Hepatology1997;25:108-11. Raynard B, Balian A, Fallik D, Capron F, Bedossa P, Chaput J, et al. Risk factors of fibrosis in alcohol-induced liver disease. Hepatology2002;35:635-8. Bellentani S, Saccoccio G, Masutti F, Croce LS, Brandi G, Sasso F, et al. Prevalence of and risk factors for hepatic steatosis in Northern Italy. Ann Intern Med2000;132:112-7. Marrero JA, Fontana RJ, Fu S, Conjeevaram HS, Su GL, Lok AS. Alcohol, tobacco and obesity are synergistic risk factors for hepatocellular carcinoma. J Hepatol2005;42:218-24. Greenland S. Interactions in epidemiology: relevance, identification, and estimation. Epidemiology2009;20:14-7.